Does anyone else know about this? Wooden Nails. So i am just a hobbyist and i enjoy learning new things about woodworking and I came across this the other day i tried to find any news or info about cost and availability and found nothing. Anyone here have any thoughts or information on how well this system will work over time. I would imagine it would be a great way to add something to the look of the finished product of whatever you use them for. Interesting, for sure. Initial cost may be high since you have to buy their guns, too. I wonder how they would do in hard maple? I know right something really hard, how well do they penetrate. The nice thing is if they dont go all the way in then its pretty easy to sand them down I would assume. I question the ability of the tiny 1/8 inch pieces to hold anything. That is about like a kitchen match. If I were making the kind of joints they are making in the video, I would feel it necessary to use dozens of them per joint. Now this is the only real original invention in wood working in a long time. I love it..
NAILS any NAILS if they are steel, wood, titanium, or kriptonite are/were never meant to HOLD/WITHSTAND A FORCE. Nails of ANY kind are to simply to hold load bearing things in place. More specifically, nails are designed for shear loads, and they do well at that. These wooden nails will probably be fine as well. As stupid as this might sound, one thing I could see wooden nails being used for extensively is constructing pallets. Think about how many forklift tires (even solid rubber ones) have been damaged by nails on the floor from disintegrated pallets? Or, burning pallets for firewood and having to collect all the metal afterwards? etc. The wood nails are impregnated with a polyester resin, so they are stronger than wood alone. I can see an application for them, but not for any place where strength is necessary. Pretty interesting. Might be an alternative to bronze for some boat building jobs. Stainless doesn’t do well in salt water (crevice corrosion) and bronze is expensive. heat the way nails do. Watched a bunch of Japanese woodworking vids. They used wooden nails sometimes. My buddy has a honey locust tree to cut down because of the thorns. Them things are about 1-2” long and I’ve read they can be used as nails when dried. Might give it a go. I use them around my neighbourhood to keep the vampire population under control! 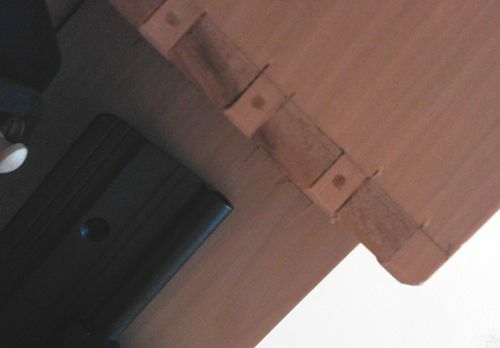 An interesting adaptation of a early japanese skill all which came about due to the shortage of steel in Japan, especially around the WWII era, now Japanese steel is the best in the world, and their wood working skills of not using glue and metal fasteners are unique even today. As Loren posted the use in high humidity areas would be a real application for them, then add the experience of plonking a bare bum (or something even more sensitive) on a sauna temp nail head! not what you would call a cool experience! Actually I did not know about them so thanks for the education lesson. Enjoy learning about woodworking its a life long experience. So, how much $ is the gun? Do they come in different gauges like metal nails? The old fashioned way, predrill and then hammer in. Edit: A note on nailing technique. If you want nails to hold pieces together, use pairs of nails driven in at opposing angles.